Molden Heath has recently became an area known for lots of fights primarily based around the ongoing war between Feign Disorder [FEIGN] and Bad Intention [BADIT]. In my previous post the fighting revolved around a R32 moon in the system of Ubtes, whereas this engagement has been moved to Altbrard over a similar objective. 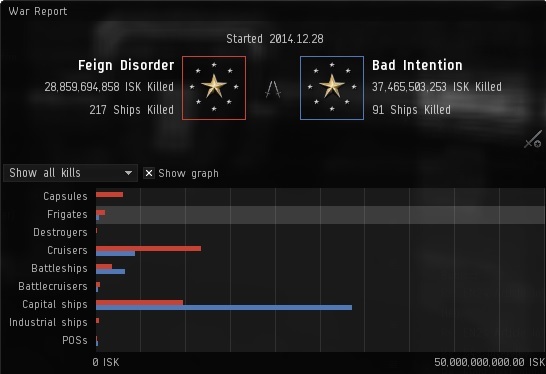 In the first of these engagements over the same POS; where Bad Intentions rallied a large array of support in an attempt to secure the objective but in fact had it ninja’d out from under them despite having over 4 times the numbers and having an ISK efficiency of only 30%, Mafia Redux [MFRX] have now joined the Feign Disorder alliance alongside Calamitous Intent [7-2]. The primary reason for this constant war is moon supremacy over the region with MFRX reinforcing a large array of E.B.O.L.A [E8OLA], BADIT and Capital Punishment [LYFT] POSs throughout the region it has now become the turn for BADIT to return the favor and turn their aggression on structures owned by FEIGN. With this constant fighting, a large array of outside entities have become involved, almost entirely on the side of BADIT. The above clearly shows that they are managing to remain successful even in the face of overwhelming odds. 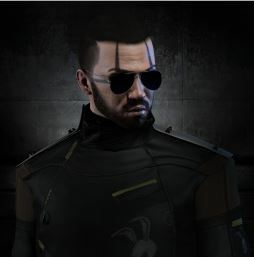 Although they have lost more in ISK value to BADIT since the war began on the 28th December 2014 they have destroyed over double the amount of ships. The fight last night could therefore be seen as round three of a continuing campaign by both parties with FEIGN and co bringing an armor battleship fleet comprising of primarily Apocalypse Navy Issues and triage Archons and dreadnoughts in support, against the Ishtar wing and dreadnoughts deployed by BADIT and allies. These compositions are examples of the standard goal of bringing something which enables you to be effective against your opponent. The Ishtar wing revolves around it’s mobility and being able to hit with deployed drones from range whereas, the Apocalypse is suited to deal high damage across a multitude of ranges due to the ability of instantly changing crystals, although with the triage it does limit the movement of the fleet to a degree by having to stay within capital rep ranges. EN24 > Hello, could you give me some info about the fight in Altbrard last night? Liam Reppola > I’m about to get some shut eye but I’ll do my best to answer your questions for the article. Thanks for taking the time to write it up! EN24 > How did the fight start, what brought it about? Liam Reppola > The instigation of the fight was simple enough. Kelts Alliance asked us for help on a POS bashing OP the night prior and we obliged. We reinforced multiple towers. Feign Disorder ensured that most of the moons would come out in their prime time. EN24 > Who was your FC and how long did it take to get the fleet up and rolling? 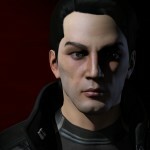 Liam Reppola > Thankfully we have a lot of capable FCs in BADIT (and our allies). I formed the fleet and FC’d, but I’m pretty quick to be primaried by this lot so we had junker man, Talon Draygo and myself take over at different times. We started to form around 45 minutes before the timer went up, and then moved to cut off Hashashin Cartel’s fleet from rendez-vouzing with Feign Disorder. However, they saw what was happening so Feign moved their fleet to support Hash, at which point we decided to cross jump Feign and take the field on the target POS. 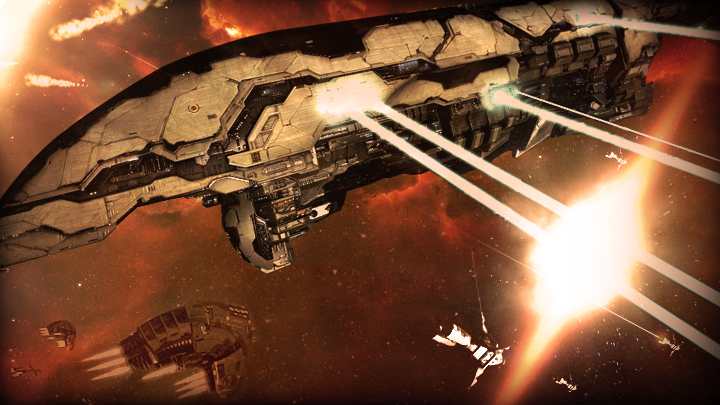 Once Feign and Hashashin landed on field with us, Solar Fleet joined in and did their thing. EN24 > Which side committed capitals to the field first? Liam Reppola > After Feign Disorder realized their Guardians were having trouble keeping their fleet alive, they opted to warp off and come back with triage Archons. We retaliated with Dreadnaughts, at which point they warped off again and came back with Dreads of their own. EN24 > What tactics were being used, ship comps etc? Liam Reppola > We decided to bring Ishtars to the fight. Our opponents fielded armour battleships (mostly Navy Apocs) and Guardians. It was a pretty standard fight between the two – Napocs counter Ishtars pretty well. We outnumbered them, roughly 200 versus 120, but they definitely had the upper hand in ship type. So, we tried to stay out of their reach while we cycled to targets in hopes of breaking them before reps landed. Additionally, this POS is just one jump away from Feign’s home system, so they were able to reship extremely quickly when needed. EN24 > Is there any bad blood between you and your foes in this fight? Is this an escalation of something which has been bubbling under the surface? If yes, can you give me some details? Liam Reppola > We’ve officially been at war for a month and a half now, and been battling longer than that. They’ve owned Molden Heath for quite some time now, and we’re just trying to keep them honest. There’s been a lot of fights, and maybe some less than amicable experiences, but I think mostly both sides are mostly interested in content generation. We’re happy with the results so far – and the war report is evidence of that. EN24 > What were your personal thoughts on the fight? Liam Reppola > It was a lot of fun, all parties went home with a lot of kills and losses. We look forward to future encounters. EN24 > Anything else you would like to add? Liam Reppola > We’d like to thank all parties involved for making the fight possible. Also, we did have a couple guys record the fight – one of which took a video and edited it for us. The video shown below has been recorded by a BADIT member piloting a Ishtar. Bizmarhk > Fight started after Solar Fleet, Kelts Alliance, and BADIT primarily reinforced FEIGN DISORDER assets in Molden Heath, this one specically our POS in Altbrard. We were able to adjust the timer, but it still ended up being on Valentines day of all days for a USTZ alliance which was slight hinderance to our ability to get numbers. We expected high resistance, based off of previous fights with these groups, and as you can see from the past AAR I sent you, these people have historically batphoned other groups, so were expecting the same. EN24 > I understand Feign and BADIT have been at war for a while, is there any bad blood between you? EN24 > Anything you would like to add, any personal thoughts? Bizmarhk > We’re really excited to have this conflict at our doorstep. We hope that we can continue to get good fights with our local enemies. Speical thanks to BADIT for bringing it, we enjoy our weekends fighting with them. EN24 > Excellent, thanks for your help on this. Overall in this engagement a total of 21 dreadnaughts were fielded with 15 for BADIT and 6 for FEIGN however only 2 survived for each party. In addition BADIT fielded 58 Ishtars lost 31 of them, whereas FEIGN, who brought 28 Apocalypse Navy Issues only lost 7. This clearly shows that even with the numbers disadvantage FEIGN have won the larger portion of the ISK war with 35B lost and 59B destroyed placing them at 62.9% efficient compared to 37.1% for BADIT. Clearly the fight was enjoyed by both parties and it looks like it will continue to expand over a variety of systems and engagements to come but it does show that, in this region at least, low sec PVP has not died quite yet. My good friend as well as I have been discussing personal blog sites and also online journaling. She feels that individual sensations and also such ought to not revealed in such open forums. I see no worry with it. Share your thoughts:. 1. Do you blog site or journal?. 2. Do you favor one-on-one expression of sensations over composed interaction?. What is a great free blog writing internet site that I can reply to blogs and also others will reply to me? How to make an application for google adsense account for my all 3 blogs and also 2 websites? 3cfoDR Very good article post.Really thank you! Really Great.